We’re at the tail-end of 2017 and what a year for astronomy and space science! I’m excited to talk about ten astronomy discoveries that help shape and change 2017. I will organize these by discovery date. Let’s jump right to it! The search for life is one of the most critical questions for astronomy and even humanity. Are we alone in the universe or are there other life forms, even intelligent ones? 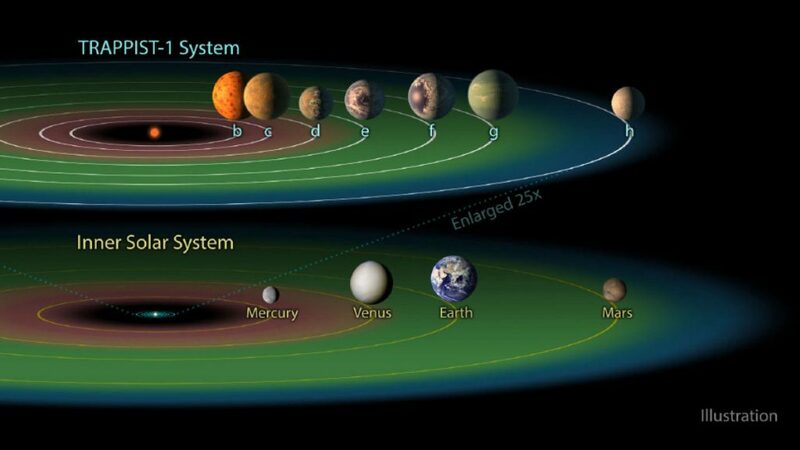 Well in February of 2017, NASA and European astronomers discovered seven planets that may support life. These seven planets orbit a red dwarf, a star much smaller and cooler than ours, called TRAPPIST-1. 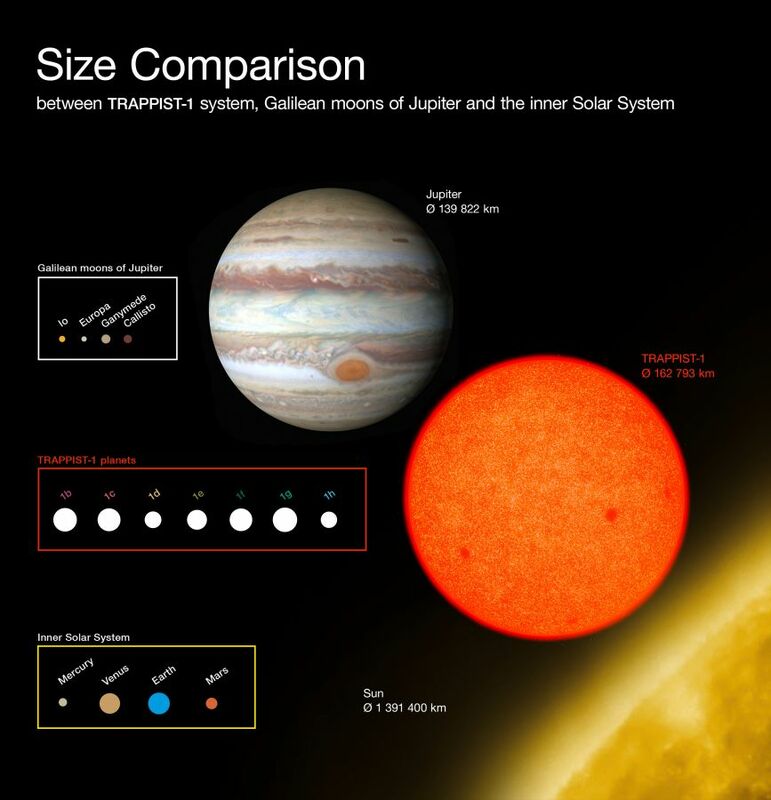 The size of this star is only slightly larger than our gas giant Jupiter. It’s located 39.5 light-years away from Earth. That means if we had the technology to travel at the universe’s speed limit, the speed of light, it would take us 39.5 years. Check out how these planets orbit TRAPPIST-1. What sticks out to you? First, my initial attention went to how incredibly close these planets are orbiting to their parent star. It’s measured in AU, which stands for astronomical unit, or the distance from our Sun to the Earth (149 million km). The furthest planet in the TRAPPIST-1 solar system is as far out as Venus in our system. In other words, Earth would be almost half an AU further out than all of these guys. Furthermore, what’s even more exciting is if you were a citizen of TRAPPIST-1b or TRAPPIST-1c (two closest planets to the star), that if you looked up at the sky, you would see the others planet like we see our Moon except for SEVERAL times bigger. Now, another thing is how fast they orbit the star. You can’t tell from the video but the orbital periods (how long it’ll take to orbit the star – year) is anywhere from 1.5 days to 18 days. I think having a birthday every 1.5 days would get boring pretty fast or on the flipside, you would be in a state of perpetual partying. I think we are starting to get an idea of how tight and close these planets are, but that’s not why this discovery is a big deal. The incredible part is all of these planets are predominantly rocky. That’s major because it opens up the realm of possibilities of being more “Earth-like.” Scientists also believe that some of these planets may have ice or even liquid water. Finally, TRAPPIST-1 is estimated to exist for at least 3 billion years to a possible 8 billion years. Our Sun is about 4.6 billion years and shows that it’s possible that life forms exist on these planets. Another crucial part is because TRAPPIST-1 is much smaller and considered an ultra-cool dwarf star that could last for up to 12 trillion years! That is one massive timeline compared to our Sun’s 10 billion-year lifetime. Saturn has put us in awe countless times. Whether it’s the hexagonal storm on the north pole to the hydrocarbon seas on Titan, Saturn has taught us so much. It’s no different this time as we turn our heads to this small unsuspecting Saturnian moon called Pan. This moon has some history which is part of the reason why the discovery turned us on our heads. The first part of this story is when scientists examined Saturn’s rings closely. The rings are fascinating, but for today we’ll stick with one particular area that called the Encke Gap. Astronomer hypothesized that the Encke gap is a result of some massive object such as a moon. They predicted precisely that it would be a single moon and the size would be 5–10×10−12 Saturn masses. When Voyager 2 approached Saturn, they started looking for this object and found just 1 degree away from where they predicted where it would be. People call Pan the “space empanada” or NASA describes as the walnut-shaped moon. Any way you slice it it’s a very strange looking moon. What is intriguing is the lip around this moon. Where do you think it comes from? Well, astronomers discovered that it comes from the collection of ring particles that accrete over time. The moon is only about 35 km across or almost half the size of Manhatten. Pan orbits Saturn through the Encke gap, which is approximately 325 km wide, in 13.8 hours. Its distance from Saturn is about 1/3 that of Earth-Moon distance. One exciting thing about Pan is that although it sweeps up ring particles, it also captures ice particles too. Meaning it’s not so far-fetched to think that if you were standing on Pan that it may be snowing from time to time. Or perhaps the surface of Pan may be soft and snowy or hard and icy. Either way, the solar system still has many surprises for us. SpaceX is making waves all throughout the year. If you don’t know already, SpaceX is a private space company led by the infamous Elon Musk that not only wants to help NASA deliver cargo to the ISS but get humans to Mars. Elon wanted to reuse rockets and made it his dream to make it happen. It’s quite unbelievable that he was able to reuse a rocket and launch this satellite to space without a hitch. Why is that a big deal? Well, it comes down to the math of it all (don’t roll your eyes just yet). When calculating the cost of a rocket one crucial part is the dollar per pound. If I want to send a satellite or a new supply for the astronauts on the ISS the cost of the rocket will depend on how efficient it is. 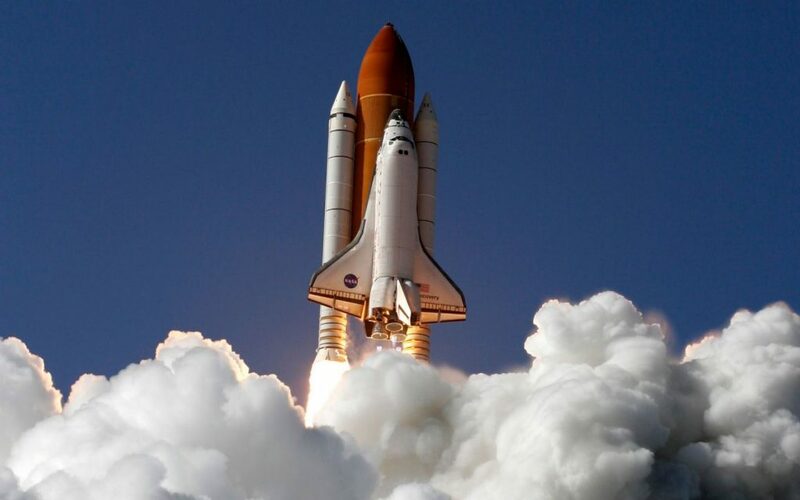 In the past, the space shuttle would cost about $8,000 per pound. It meant that the cost of one rocket would be nearly $450 million. The shuttle program vision was to get cheaper over time, but that never happened, which led to the cancellation of the space shuttle in 2011. Enter Elon Musk. In the early 2000’s he wanted to start his own space company and found out fast how expensive they are. He learned that there were huge markups because they outsource different parts of the rocket construction. That culmination is how SpaceX was born. 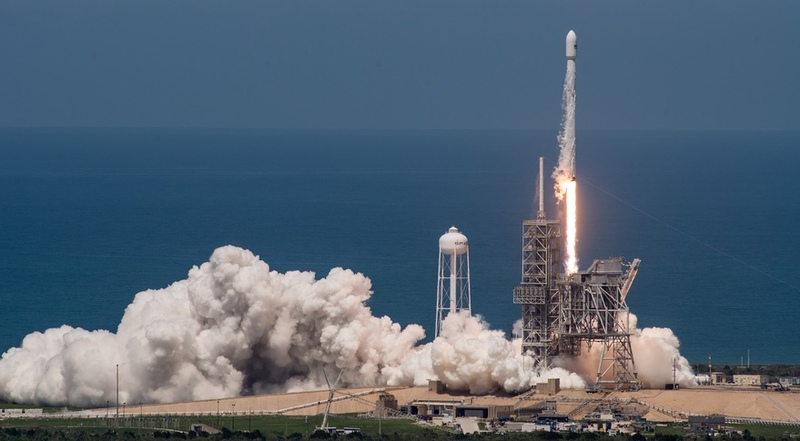 They would construct everything in-house and set sights on the ambitious goal of creating a reusable rocket. Remember how the space shuttle cost $8,000 per pound? Well, Elon got that cost down to $1,000 per pound or about $62 million per flight. It took more than a decade to get here as well as some competitors like Blue Origin wanted a piece of the action too. In 2017 it’s a major achievement that not only SpaceX can provide a low-cost flight to lower Earth orbit but is reliable as well. To get some appreciation of this story we need to give you a little context. The concept of dark matter and dark energy is at the frontier of our understanding of the universe. It’s interesting how we stumbled onto it. The expansion of the universe was thought of to be slowed down by gravity. However, Edwin Hubble discovered the expansion of the universe is not being slowed down but in fact expanding. Edwin’s discovery shook the very foundations of science and what we thought we knew about the universe. Enter Albert Einstein. He is working away on some very difficult problems, even for Einstein a man who published his theory of relativity at the age of 26. The problem he was trying to solve is how the universe works in respect to the fundamental interaction of gravitation as a result of spacetime being curved by mass and energy. These are famously called Einstein’s field equations (EFE). He included the cosmological constant λ to show that the universe was not expanding or contracting. However, he found out that if the universe was really like this that it should not simply exist at all. What is Einstein to do? Well, he called this his “biggest blunder he ever made.” However, as we know Edwin Hubble discovered that in fact, the universe is expanding. Einstein got wind of this and put back λ in the equation as scientists learned a positive value of λ is needed to explain an accelerating universe. Not only that but Einstein actually stumbled upon dark matter and dark energy. Thus, we now know that dark energy is the reason why the universe is expanding faster. His biggest mistake turned out to be one of the biggest mysteries and epiphanies in human history. Okay, so why the history lesson? Glad you asked. Since Einstein stumbled on dark matter and dark energy or simplifying that to the fact empty space is not just empty space but can possess its own energy. 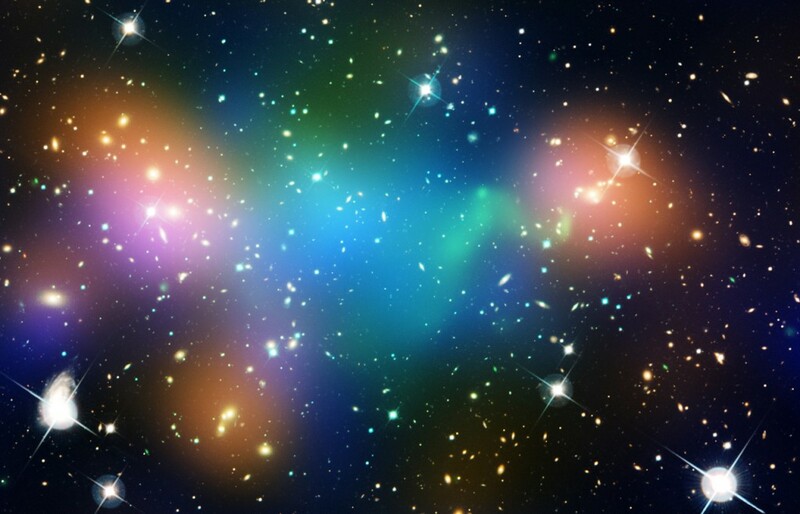 Keeping that in mind it is hypothesized that the space between galaxies is tied or connected by dark matter. 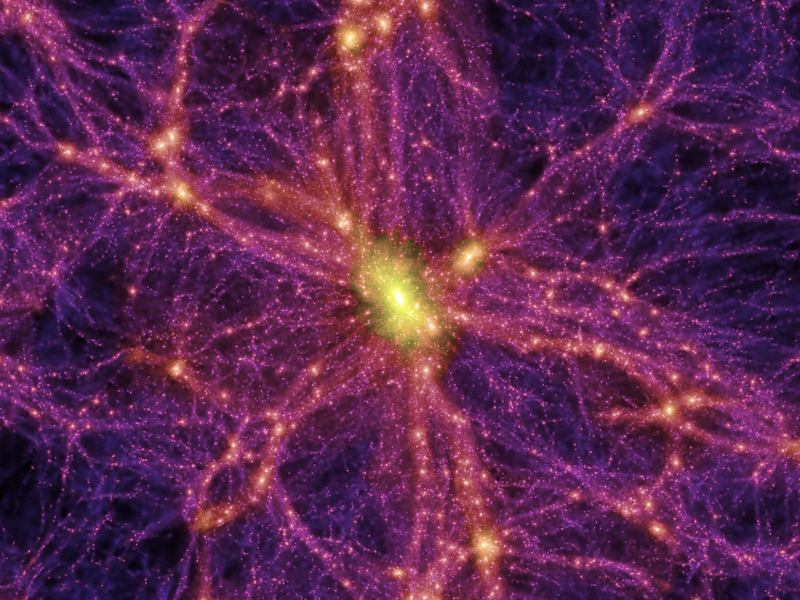 You can think of this as a web of dark matter. Researchers have not been able to prove this, until now. 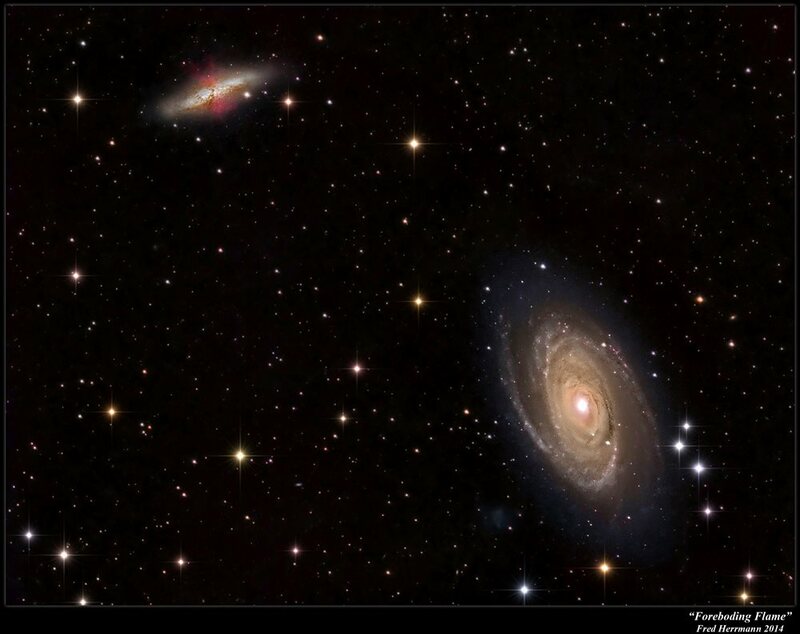 The photo you see here is direct evidence that galaxies are connected with dark matter. The areas in white are the galaxies and the areas in red are dark matter. How did they produce this photo? 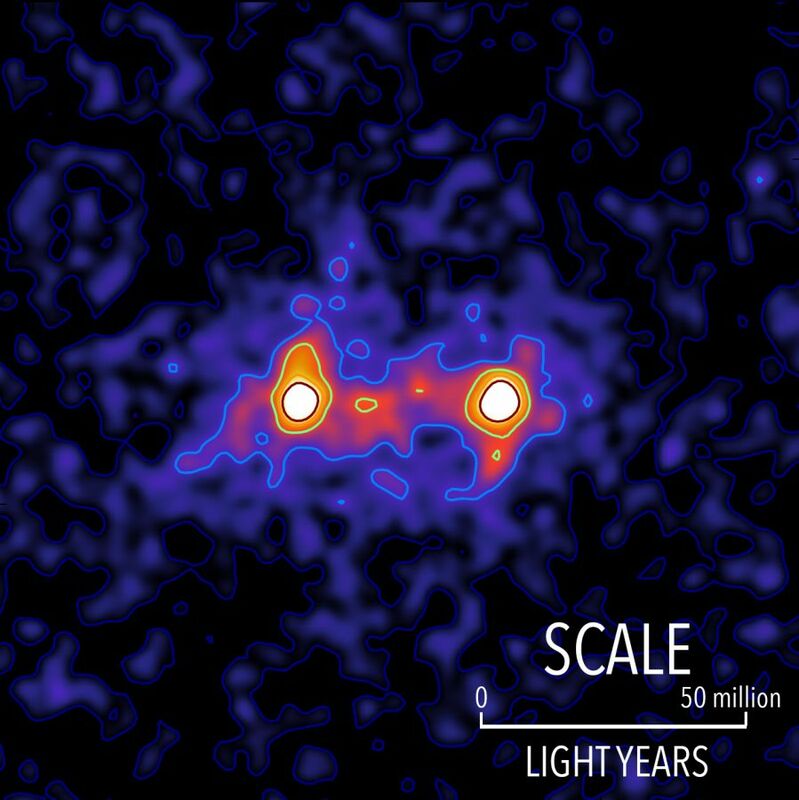 Researchers, combined lensing images of 23,000 galaxy pairs located 4.5 billion light-years away to create a composite image or map that shows the evidence of dark matter between two galaxies. The fact we now have this image is huge for science and I’m sure Einstein would be ecstatic to learn and see this if he were alive today. I will leave you with a famous stat of the makeup of the universe. As of 2017, we know that 68% of the universe is dark energy. We also know that 27% is dark matter. Meaning, everything on Earth, or anything in the universe that has matter and we can see it with our instruments is just 5%. That’s right, everything you can touch and feel and see is just 5% of the universe. I’m not sure what is more humbling then appreciating that everything we know from science and observation gets us an understanding of 5% of the universe. Have you ever wondered what happens when two black holes merge together? What if I told you that you could feel the vibrations of two black holes merging even if they’re located 3 billion light-years away (or it would take you 3 billion years to reach this place traveling at the speed of light). Pull up a chair and listen to this (okay maybe you’re already sitting down). Einstein (yes him again) predicted an effect called a gravitational wave. That all things, even humans, give off gravitational waves. In fact, it’s really hard to measure it on smaller masses like humans, planets, or even stars. Consequently, scientists created an instrument that could detect gravitational waves called Laser Interferometer Gravitational-Wave Observatory (LIGO). 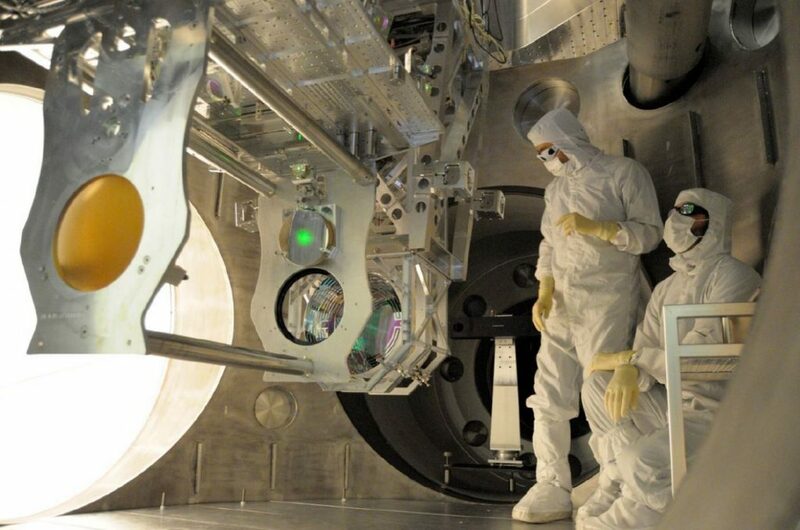 LIGO will detect vibrations on such a precise level that it can tell you where in the universe this gravitational wave came from. Imagine, two massive black holes circling each other. Their speed and proximity both increase more and more as time progresses. Suddenly, they are within mere kilometers of each other and speeding up so fast that it’s practically unfathomable. As a result, it’s giving off large gravitational waves that let the universe know something immense is happening. Here’s a video of a simulation how the merger happens using LIGO’s data. Notice how much faster it speeds up just before the merger. It’s amazing to imagine a black hole that weighs as much as 49 times of our Sun’s mass. In fact, in the moment it merged it shed more energy than all of the energy of the stars in the observable universe. Then imagine having two of those merging together to create a fantastic black hole. 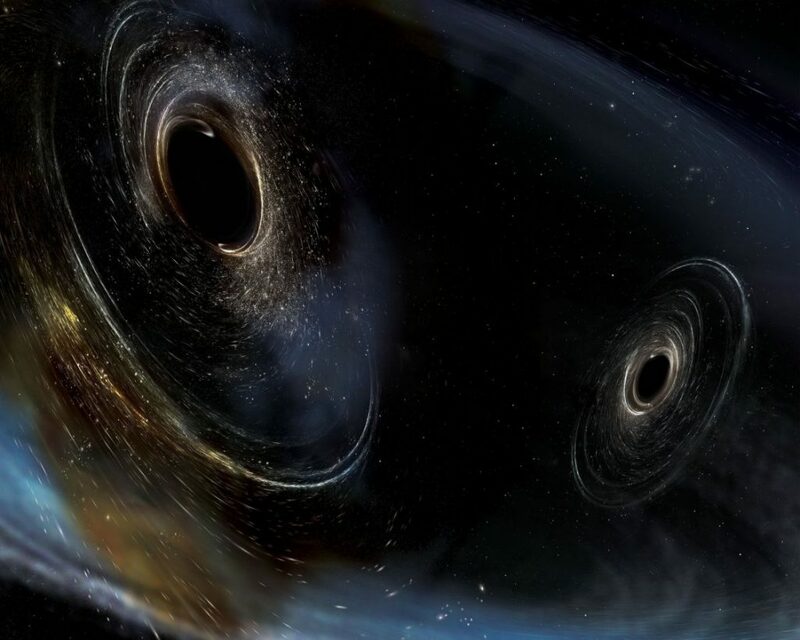 Nevertheless, why do we care if these black holes are merging? It’s fun to think about but what does that do for humanity? What applications does this have? As a result, we can move away from sci-fi and towards black-hole astronomy. An important discipline because at the heart of every galaxy is a supermassive black hole and a possible end of the universe is one filled with just black holes. They can be tough to examine because of the sheer authority over forces like gravity. We can safely say that we’re in a new era of astronomy that has many discoveries just waiting for us. Our solar system has been through a lot in the last decade or two. Pluto is not a planet anymore and is considered a dwarf planet, leaving us with 8 planets. That’s not a bad thing just an example of how science and astronomy change rapidly. 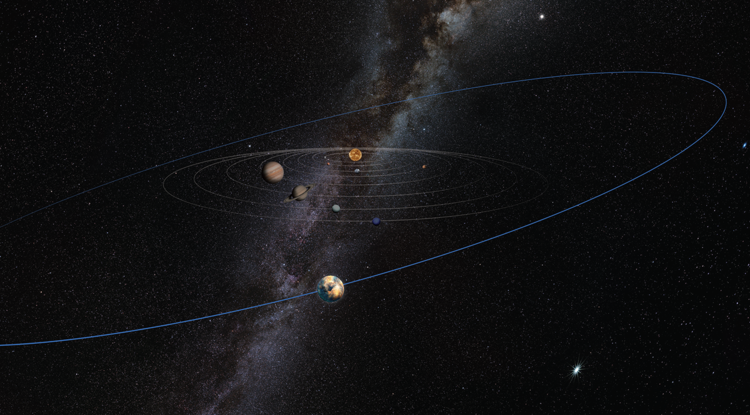 Fast forward to 2014 a possible ninth planet, the size of 10 Earths, may exist beyond Neptune. In fact, it’s so far away that it’s 700 times farther than the distance from our Sun to planet Earth. Meaning it’s 144 million kilometers x 700! That’s unfathomably far. It’s so far that it takes 10,000 to 20,000 years to complete one orbit around the Sun! I would not want to have a birthday on that planet. Okay, so let’s jump to June of 2017. Astronomers at Arizona State University discover a planet 10. However, this planet is not 700 times farther away or 700 AU but 60 AU. The planet’s size is between Mars and Earth, which is a familiar size we can wrap our heads around. So why is this a big deal? Well, for one, the fact we’re still finding more planets after looking up at the night sky for more than a thousand years. You have to think about all this technology that we have and massive telescopes on the ground and in space that are constantly looking all over the universe. 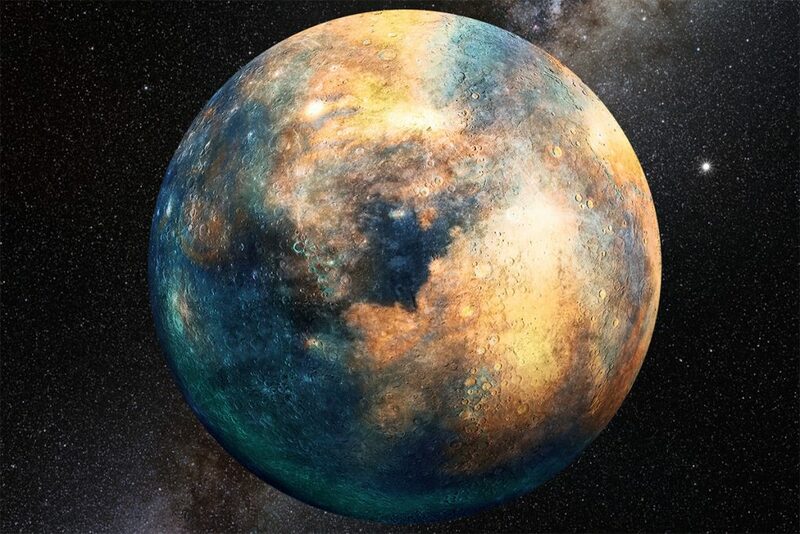 It’s astounding that not only pluto-size planets exist in the Kuiper belt (the ring of asteroids beyond Pluto). The second part is it shows that a solar system can possess more planets than we can imagine or estimate. For example, take our own Milky Way. It has 100 billion stars. Pause and think about that for a second. Each one of those stars has planets. Looking at our own solar system we have 8 major planets and numerous dwarf planets and possibly a half-dozen planets roaming on the outskirts. Why does the number of planets matter? The number matters because it shows us that there could be more possibility of life on other planets. Of course, astronomers care more about the habitable planets. The ones that are like Earth, where you get plenty of Sun and energy. That being said, we know life can really exist almost anywhere. For example, the infamous water bear or Tardigrade can survive in close to absolute zero temperatures. That’s nuts! We have a lot to learn about our solar system, but this finding could be the momentum we need to get more eyes on the solar system. Our ancestors would be enthralled to see what humans have discovered about their home, their solar system. One of the important questions we ask as humans and of course in science is where did we come from? How did we get here? What happened before we got here? These are all questions that scientists have been chipping away bit by bit. However, most of our answers revolve around Earth and how it came to be this terraqueous blue planet. Our galaxy the Milky Way is a whole different story. We know that the Milky Way is a large galaxy, relative to the galaxies we’ve observed thus far, and is about 100,000 light-years across. The fascinating part is the way galaxies accumulate matter. Why this is a big deal is because it gave us insight on how galaxies grow in their infant stages. Knowing that this happens early on means that our galaxy is made up of many different stars from other galaxies. It’s amazing to think that our star may not even be from the Milky Way but could be from some other galaxy whose star went supernova and ejected their mass. That mass was then carried by a galactic wind and then over time enough of it collected together that it started to form a new star, possibly our Sun. Learning this can make you feel like you are truly unique and got here by such extraordinary events. When people think about what the most explosive event is in the universe they may think about the supernova. While they are quite intense events there is one that may break your brain. Say hello to the most energetic event in the universe, a Gamma-ray burst. 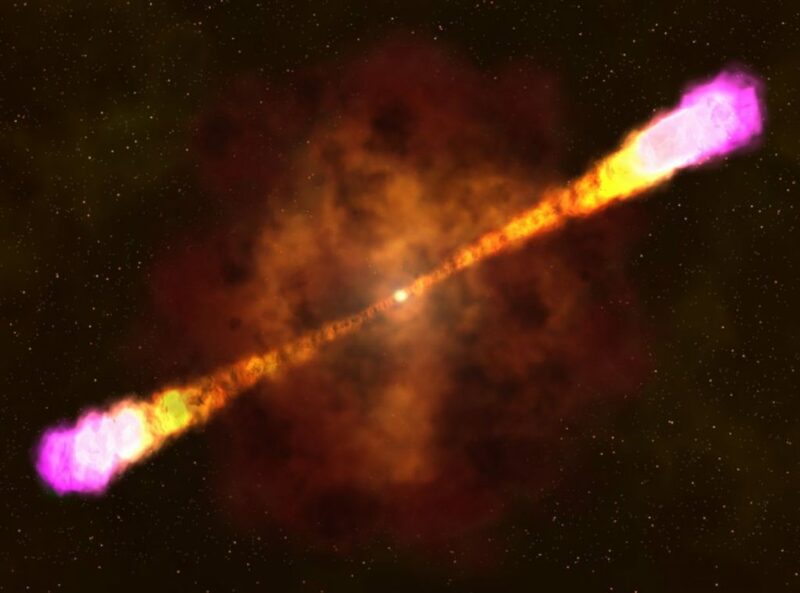 What is a gamma-ray burst and how does it happen? Well, it’s when a massive star collapses and forms a black hole. However, this black hole is eating more than it can handle. In fact, it’s so fierce when it eats that it ejects matter at the speed of light. Oh, and did I forget to mention that this ejection can be seen as far as 7.5 billion light-years away from Earth with the naked eye. The amount of power a gamma-ray burst emits in the 2 seconds to 30 seconds it’s around for is as much as our Sun’s lifetime of energy! However, don’t fret. Gamma-ray bursts are rare and happen to a galaxy every few million years. Now, why is this discovery important? Gamma-ray burst were mysteries until 1996 when the first one was detected. The observation of this gamma-ray burst called GRB 160625B (catchy name) answered some long-standing questions. It helps answer how gamma-ray burst evolve as the dying star collapses to become a black hole. What they learned is that the black hole produces a strong magnetic force that takes over as the dominant force over the energy emission jets. Next, as the magnetic field starts to break down, matter takes over and becomes the dominant force over the jets. Researchers thought one or the other would dominate, but didn’t expect both would play such a key role. Lastly, astronomers have been aching to get data on what’s called Synchrotron radiation. That may sound like jibberish to you, but the significance of that is what happens when electrons are accelerated in a curved or spiral pathway. To put it a little more simply it’s what powers that extremely bright phase of the burst. 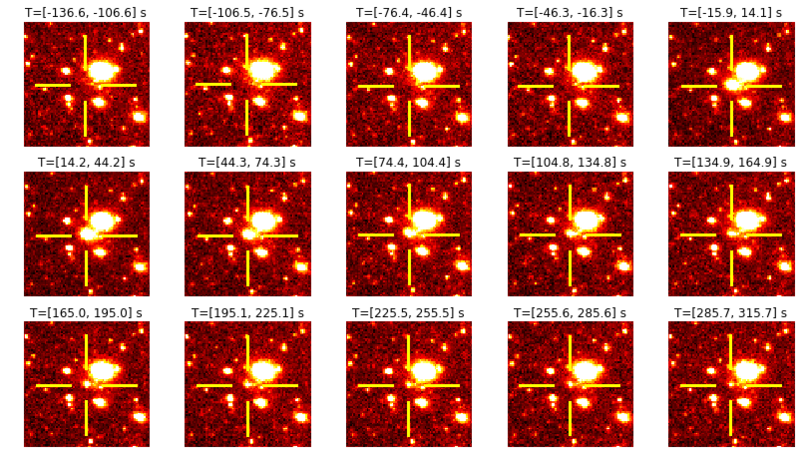 You need extremely good reaction time and coordination with the telescope to capture this data. And guess what? Your astronomer buddies were able to capture this for the first time! The more we can understand gamma-ray burst the more we can figure out how it all works and possibly keep us out of harm’s way. It wasn’t just a mission where Cassini would simply stop working. Scientists had one final task for Cassini to capture data in a way that had never been done before. 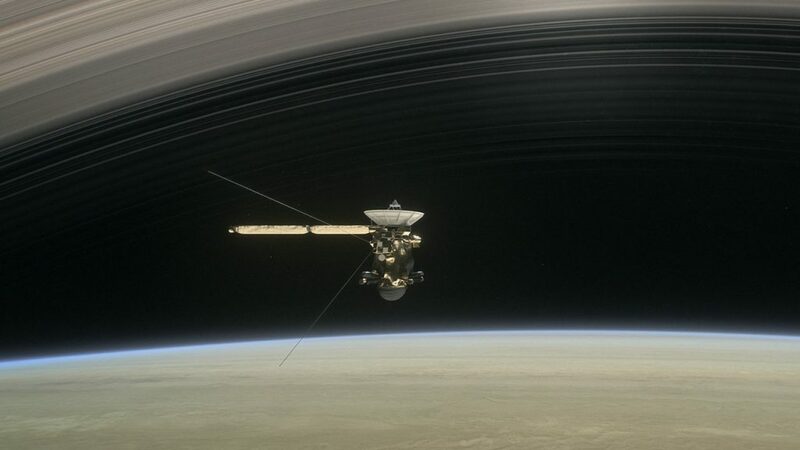 Cassini ‘s task is to enter Saturn’s atmosphere and send back data before it plunges so deep that it would finally crash. This grand finale wasn’t simple and required the spacecraft to maneuver between Saturn and its rings. 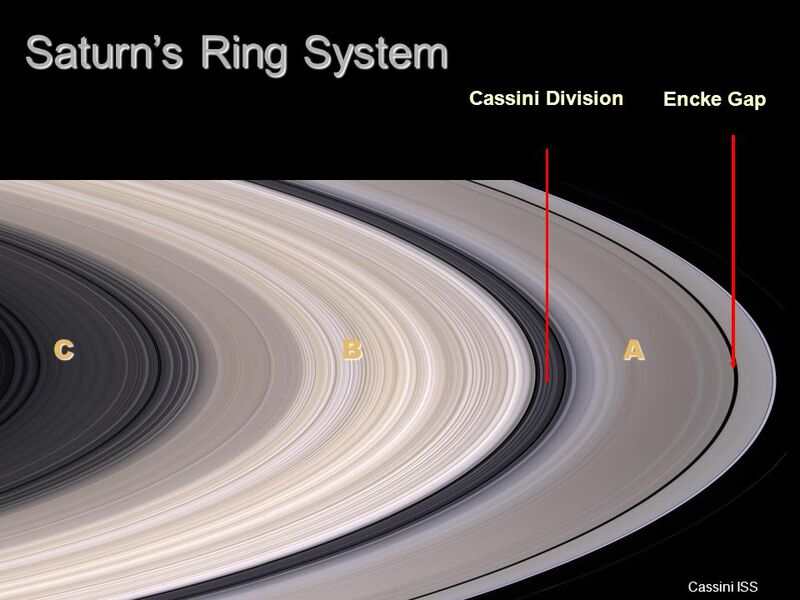 The rings would pose one of the greatest threats because it’s filled with icy rocks that range anywhere from a micrometer to a meter in size. In space, where friction is almost non-existent, an impact from any of these rocks would cause major damages. The Cassini mission wasn’t just about Saturn but also the moons. Titan, a rare moon in our solar system that has an atmosphere and a hydrocarbon sea, gave us so much wealth of knowledge that even sci-fi couldn’t have painted such an amazing world. I mean, we actually landed a human-made probe on Titan! That feat still astounds me to this day. The mountain of data that Cassini has provided will not only change how we look at Saturn in 2017 but as we dig more into the data, will discover even more about Saturn in the years to come. We’ve gone through many different bizarre and exciting stories in 2017. However, I believe this one takes the cake for really surprising all of us. 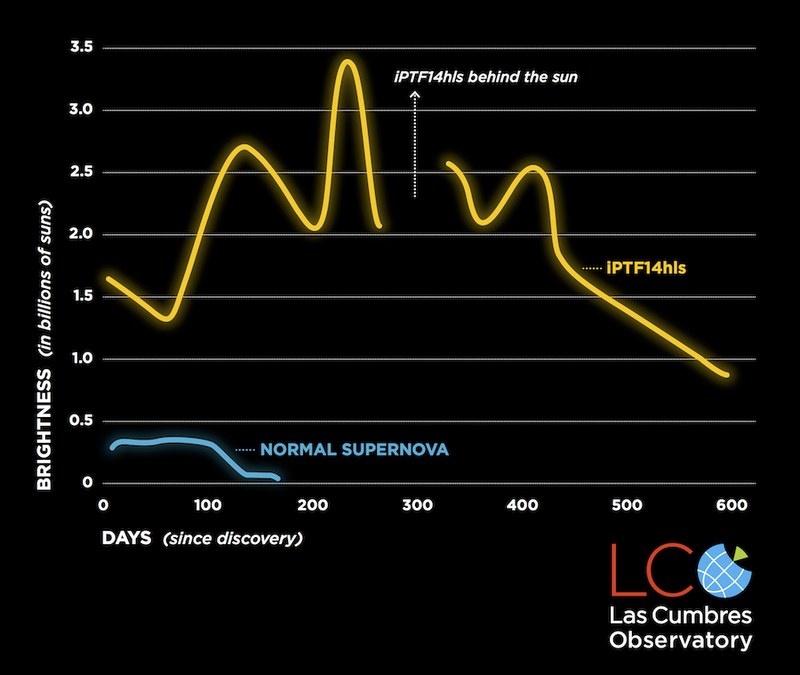 A star called iPTF14hls (another catchy name) turns out to have gone supernova twice. Usually, after the initial supernova, the brightness dims after 100-days. What makes this star even stranger is the fact it has fluctuated between bright and dim five times over the course of three years. Could you imagine our Sun changing dramatically between dim and bright in our sky over three years? That would probably freak you out a little at the very least. What’s interesting is they observed IPTF14hls not only gone supernova twice in the last three years but erupted 60 years ago as well! 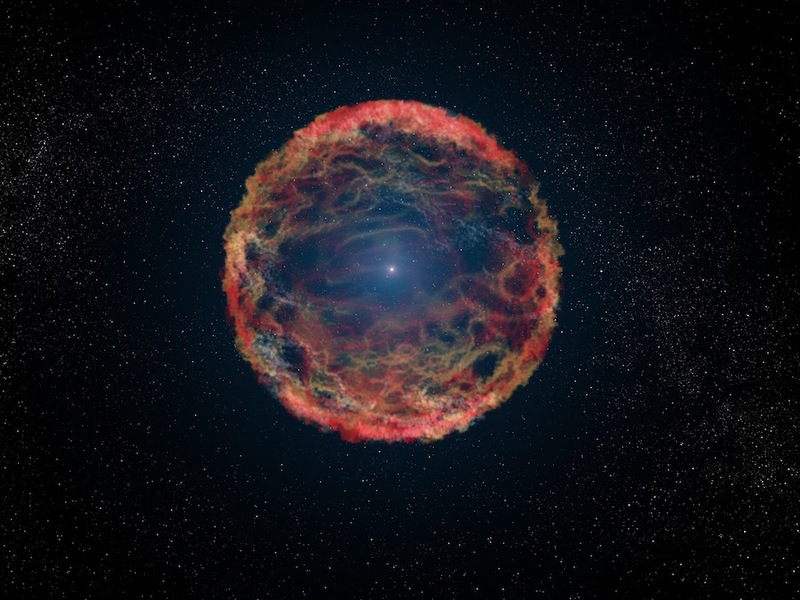 Up until now, scientists have always seen a star completely die once it has gone supernova. However, this star is breaking all the rules and has deeply perplexed us in how stars could do this. The leading theory is called pulsational pair-instability. This requires the star to be about 130 solar masses (130 of our Sun). What happens is when a star reaches a size above 100 solar masses that it starts to behave differently. A star is always fighting to stay in equilibrium between balancing pressure and the force of gravity (pressure pushing out and gravity pushing in). This massive star then increases its core temperature to 1 billion degrees C. Over time this core temperature rises to 3 billion degrees C.
Now, at these temperatures oxygen fuses explosively and blows off massive amounts of matter, the object shrinks, and resets the cycle. The process repeats until the star reaches a stable mass. When the ejected shell hits the trailing edge fo the previous shell, it releases energy as light. What is strange is this would normally explain iPTF4hls except the fact that pulsational pair-instability stars end their life in black holes. That is not the case here, which makes this discovery all the more exciting to figure out what is happening.